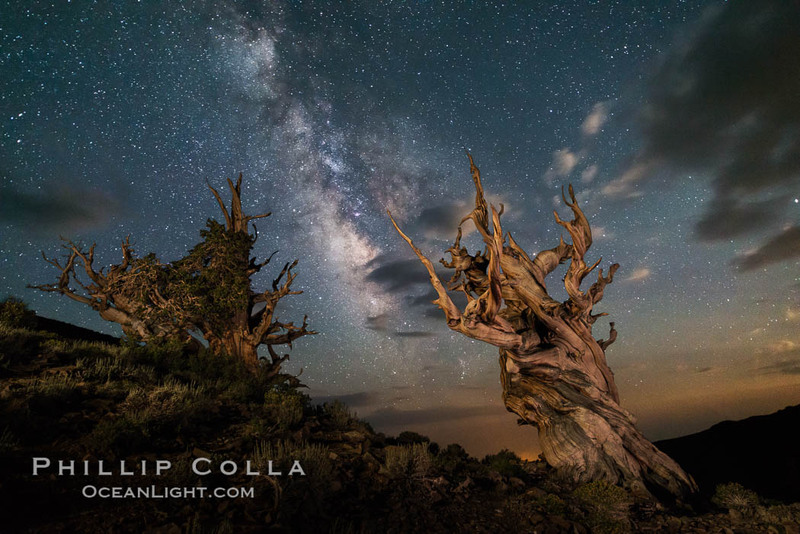 If you like this, please see my Gallery of Ancient Bristlecone Pine Tree Photos or my Gallery of Milky Way Photos. These ancient bristlecones are two of the more iconic in the world. They stand on an eastern slope in the White Mountains in a clearing with few other trees nearby. I am fairly certain the foreground tree — which has been photographed by thousands of photographers — is dead. It has a beautiful, gnarled, twisted shape and is quite imposing. The living bristlecone (Pinus longaeva) in the background is my favorite in this area, and one of the most beautiful of the old but living bristlecones anywhere along the White Mountains crest. It was the subject of the first milky way photograph (after many attempts) with which I was really happy, made alongside buddy Garry McCarthy in 2012. The evening I made this particular photographs brought a fast changing mix of light, with clearing storm clouds that alternately moved through the scene and then opened up to reveal stars. I timed my visit specifically for this one night since I knew the lunar phase would balance moonlight with starlight and lend a little bit of detail to the surrounding landscape, something that is more difficult to achieve on the new moon. I’ll post a few more from that night in the coming days. Cheers and thanks for looking! Stars and the Milky Way over ancient bristlecone pine trees, in the White Mountains at an elevation of 10,000′ above sea level. These are some of the oldest trees in the world, some exceeding 4000 years in age. Ancient Bristlecone pine trees (Pinus longaeva) live in a relatively restricted area of eastern California, Nevada and Utah, typically at altitudes above 9500′. The ancient bristlecone pine tree is considered to be the world’s oldest species of tree (and indeed the world’s oldest sexually reproducing, nonclonal lifeform). A number of individual bristlecone pine trees are known to exceed 4000 years of age; the “Methuselah tree” in the Schulman grove was estimated to be 4838 years old in 2006. These extraordinarily hardy, gnarled and lonely trees are best seen in the White Mountains of the Inyo National Forest in California. These photos were taken in the Patriarch Grove and the Schulman Grove, two exemplary groves that can be accessed by car. A few new images below and in my gallery of bristlecone pine tree photos were taken on a clear spring night with the Milky Way spread across the sky — it was a moving and serene experience being around such old trees with the heavens spread so dramatically above.